Cordovan « DDOcast – A DDO Podcast! Cordovan & Propane join us for DDOCast 401 as we look at the proposed changes to manyshot, arcane archer & news for The Night Revels event. We also talk about DDO’s vast and beautiful explorer areas and how they can be a part of your gaming! It’s Episode 400!!! It’s an epic show as we celebrate 400 episodes of DDOCast. First we cover the news with our founder Jerry Snook. Then we get crazy with some interviews of some of our contributers, we have new versions of some of our segments, we have a few segments from our past, old commercials and other fun stuff!! A special thanks to all of the folks that have helped make DDOCast fun, exciting and informative for 400 episodes! We weren’t able to include everyone in this show but we have good representation across the lifespan of the show. *These are old content from previous episodes of DDOCast and may contain elements that are not current. 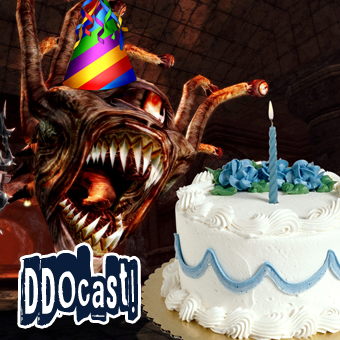 Join Sig, Anne, Geoff (http://www.ddogamer.com/) and Jerry as we celebrate DDO’s 7th B-day by singing very badly! Don’t worry we stop and move on to the latest news in DDO: Birthday announcements by Sr. Producer Glin, a note from Exec. Producer Fernando, quick review over U17, and more! Official Press Release: WB and Hasbro/WotC announces a new expansion to DDO to be Developed by Turbine! Contact Us! Questions, comments, rants, raves! We also love DDO segments! Episode 225 is ready! Here’s a LINK to the episode – just left-click to play, right-click and ‘save as’ to download as an mp3. You can find DDOcast on iTunes, the Zune Marketplace and Cyberears.com. 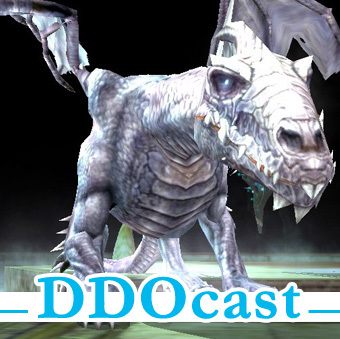 This week Sig and Anne are joined by Turbine Reps Tolero, Cordovan and ProducerGlin in honor of DDO Podcasting Month! We get the skinny on U10.1 Crafting Issues, ProducerGlin goes over his EU PR trip, DDO news and events. In our Round Table, Sig talks about community relations with Tolero and Cordova. We also have DDO Poetry Corner and Epic Education goes over on how to do a Speed Shroud! Today’s Music GAME ON by The Guild (feat. Sandeep PAH-REEK & Felicia Day) If you don’t know who or what The Guild is…What rock have you been living under? They’ll be premiering their latest Season Five on July 26th!! (WOOT!) The Guild is a independent sitcom web series about a group of online gamers. You can find more info about them on their website at http://www.watchtheguild.com/. You can also purchase the song and video of GAME ON and on iTunes and Amazon. 37:28 DDOcast News: We’ve ordered Art! 2:01:23 Last Call: Please test on Lamannia! Pretty Please?! LINK for Jolly Jester in the House and Extended! LINK for Episode – 4 of Kal’s Den is up – What’s in a game? 2 hour show! LINK for Download the Lamannia Client and Test Test TEST! To get Cannith Crafting back up and running! And Oh yeah. don’t forget to test other important things like the loot system!